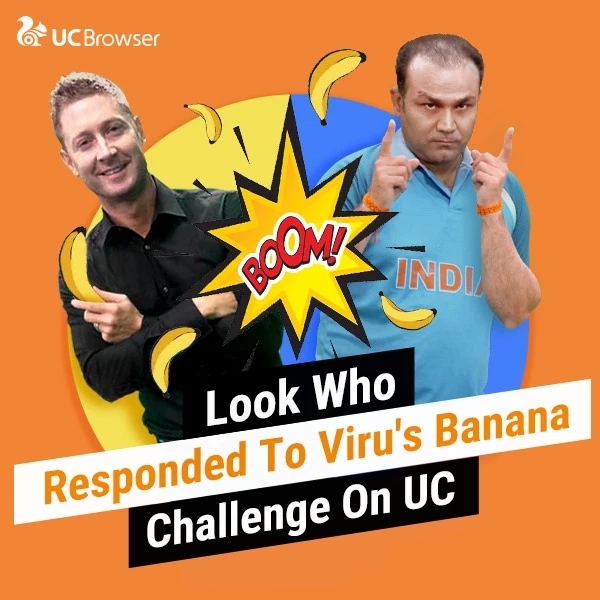 Legendary Indian cricketer Virender Sehwag and former Australian captain Michael Clarke’s Banana Challenge has gone viral on UC’s WeShare channel. Roped in as the spokesperson for the UC WeShare channel, Virender Sehwag and Michael Clarke have been engaging in friendly banter to present trendy and enjoyable content to cricket lovers across the nation. The two engaged in a fun challenge where Sehwag, known for his sharp wit, startedthe banana game and challenged the former Australian skipper Michael Clarke to accept the challenge with a blind fold. The video of the cricketers struggling to catch the banana has left social media users in splits. Numerous users on VMate, a short video platform owned by UC, have answered the call for#BananaChallenge while the playful videos are watched by millions.Within one day the exposure of the banana challenge has reached millions of impressions. With the newly launched WeShare Channel, UC is all set to create a benchmark in the Indian market with localized, entertaining contentincluding short videos, memes, GIFs and more. Not limited to trendy cricket feeds, UC WeShare channelizes a space where users can communicate with friends and share jokes within seconds through a few simple taps.Based on the popular features, UC has enhanced the short video experience and added new features such as trends ranking and more. The launch of the WeShare channel will meet the growing demand for short content in India. UC hopes to leverage the trend and strengthen its leading presence in the market by feeding its 130 million Indian MAUs through the channel.